Written and directed by David O. Russell from a story by Russell and Annie Mumolo, Joy is a loosely-based bio-pic about the life of Joy Mangano as a woman who would become a self-made millionaire and run her own empire despite the dysfunctional presence of her family. The film is a look into a woman who comes from a troubled family forcing her to do things by herself as she would gain fame through a series of inventions as Mangano is played by Jennifer Lawrence. Also starring Edgar Ramirez, Virginia Madsen, Diane Ladd, Isabella Rossellini, Bradley Cooper, Elisabeth Rohm, and Robert de Niro. 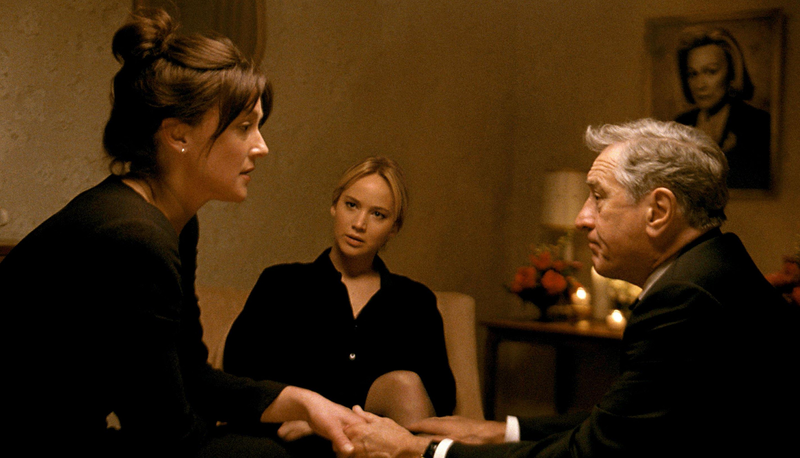 Joy is a compelling though messy film from David O. Russell. Set in 1990 upstate New York, the film revolves around a mother of two children who shares her house with her grandmother and mother while working for Eastern Airlines as a booking clerk with her ex-husband living in the basement. Yet, Joy Mangano’s life is about lost potential who had dreams to create things when she was a kid but the dysfunctional life of her family which included her father Rudy (Robert de Niro) moving in to her home after a break-up where he would share the basement with Joy’s ex-husband Tony (Edgar Ramirez). When Rudy gets a new girlfriend in the rich Italian widow Trudy (Isabella Rossellini) and she invites Joy and Joy’s older half-sister Peggy (Elisabeth Rohm) to the boat. Joy gets an idea while cleaning spilled wine on the boat as it would be the start of an empire as well as tapping into the lost hopes and dreams she had when she was a child. David O. Russell’s screenplay is partially told through the perspective of Joy’s grandmother Mimi (Diane Ladd) as someone who had seen Joy’s potential when she was a child and then be destroyed when her family was torn apart by divorce with Rudy going to someone else while Joy’s mother Terri (Virginia Madsen) spends much of her life in her room watching soap operas to escape from the harshness of reality. The script is often messy and can be over-the-top in its usage of flashbacks in the first act where Joy looks back at her marriage to Tony including their wedding reception in which her father embarrasses her. Joy is definitely at the center of the film as someone that is dealing with the fact that her life hasn’t gone well as she often has to deal with Peggy’s comments while Rudy often makes cynical comments though he means well. Tony is at least supportive as he would become one of the few that really believes that Joy can succeed through the invention of the Miracle Mop. Yet, would face challenges including from those who claimed to have a patent over the creation of the mop while Joy would find an outlet to sell her mop through the emergence of QVC. Russell’s direction does have elements of style as it play into the setting and time period of the 1980s and early 1990s while much of his compositions are straightforward. Shot on location in and around Boston, Massachusetts with additional locations at Wilmington, Massachusetts, Russell would create a film that is set largely in the winter to play into the look of upstate New York where the characters live in which include the garage that Rudy owns which is managed by Peggy. There are some wide shots of the locations including scenes at the QVC studio that include this telethon studio that turns around for a different set. Yet, Russell would maintain an intimacy as it relates to the family drama where it can be overwhelming at times due to the number of people arguing over Joy in the usage of close-ups and medium shots. The film’s second act would loosen up as it relates to Tony taking Joy to a studio where she would be introduced to QVC and an executive in Neil Walker (Bradley Cooper). The fact that the script is told partially from Mimi’s perspective does make the film tonally uneven as it would also affect the film’s pacing leading to its third act where it is about some of the business problems caused by Joy’s family over these people involved in parts manufacturing. Especially as Joy knew she had to pay certain amount of royalties to a man who created a patent for this mop as she would be forced to take control of her empire by herself with only a few such as Tony to be the ones to really support her. Her action to confront these men who are trying to ruin her would show what she has to do as it relates to the questions that Trudy has asked about what is a person willing to do to succeed. Overall, Russell crafts a fascinating though flawed film about a woman who finds her lost potential in creating things and later build an empire. Cinematographer Linus Sandgren does excellent work with the cinematography with the look of the daytime exteriors with the usage of natural lights while going for something low-key and low for the interior scenes at night. Editors Alan Baumgarten, Jay Cassidy, Tom Cross, and Christopher Tellefsen do nice work with the editing as it is stylized in some parts while it is mainly straightforward to play into the drama. Production designer Judy Becker, with set decorators Gary Alioto and Heather Loeffler plus art director Peter Rogness, does brilliant work with the look of the sets at the QVC building as well as the home where Joy and her family live in plus the garage her father owns. Costume designer Michael Wilkinson does fantastic work with the costumes as it play into something that looks casual in some parts but mainly play into the look of the late 80s/early 90s. Visual effects supervisors Trent Claus and Gregory D. Liegey do terrific work with the visual effects as it is mainly set dressing for the look of the different places that Joy and other characters go to. Sound designers Jason King and Jay Nierenberg, with sound editor John Ross, do superb work with the sound as it play into the chaos inside Joy’s home as well as the scenes at various gatherings and at the QVC studio. The film’s music by West Dylan Thordson and David Campbell is wonderful for its mixture of orchestral music with bits of rock in parts of the film while music supervisor Susan Jacobs provides a soundtrack that mixes Latin music, pop, rock, and jazz to play into the different worlds that Joy encounters. The casting by Lindsay Graham and Mary Vernieu is marvelous as it feature some notable small roles and appearances from Donna Mills and Susan Lucci as soap opera actresses, Drena de Niro as a QVC saleswoman in Cindy, Jimmy Jean-Louis as a Haitian repairman in Toussaint whom Terri falls for, Madison Wolfe as the young Peggy, Emily Nunez as the young Jackie, Isabella Crovetti-Cramp as the young Joy, Aundera and Gia Gadsy as Joy/Tony’s daughter Cristy, Tomas and Zeke Elizondo as Joy/Tony’s son Tommy, and Melissa River in a wonderful performance as her late real-life mother Joan Rivers who sells things for QVC as it’s so dead-on. Dascha Polanco is superb as Joy’s best friend Jackie who helps her out with some of the business aspects in selling the mop as well as one of the few who really believes in her product. Virginia Madsen is fantastic as Joy’s mother Terri as a woman who had lost a lot of hope in reality by spending much of her time watching soap operas until she would fall for a repairman and bring some encouragement to Joy. Isabella Rossellini is excellent as Trudy as an Italian widow who becomes Rudy’s new girlfriend as a woman who isn’t sure about Joy’s new idea as she reluctantly gives her the money only to find a way to get it back. Elisabeth Rohm is brilliant as Joy’s overachieving half-sister Peggy as someone who constantly belittles Joy to prove that she is superior and would end up causing financial trouble for Joy against Joy’s will. Diane Ladd is amazing as Joy’s grandmother Mimi as a woman who is Joy’s greatest supporter as someone who is also a dreamer and had seen a lot of the struggles the family has endured. Edgar Ramirez is incredible as Joy’s ex-husband Tony as a failed musician that doesn’t like Joy’s father very much as he would be the one to get Joy to meet with QVC and be one of her true supporters in her ideas. Bradley Cooper is terrific in a small role as Neil Walker as a QVC executive who sees what Joy has created and decides to help her sell the Miracle Mop in the hope that it would make money. Robert de Niro is remarkable as Joy’s father Rudy as a man who means well but often embarrasses Joy while often favoring his daughter as it’s a flawed but fun performance from de Niro. Finally, there’s Jennifer Lawrence in a phenomenal performance as the titular character as a mother of two children with an ex-husband that is dealing with her life believing she’s failed until she came up with another idea as it is one of Lawrence’s finest performances. Joy is a stellar though flawed film from David O. Russell that features an incredible leading performance from Jennifer Lawrence. Along with its supporting cast, cool score, and an engaging story that is very messy in its structure and tone. It’s a film that has a fascinating look into the life of Joy Mangano though it tends to overwhelm itself with all of the family drama and wanting to be this study into the cutthroat world of business. In the end, Joy is a very good film from David O. Russell.